One of the rugby players loved by everyone has thought he has done enough in England and has moved to France’s rollercoaster club Toulon. 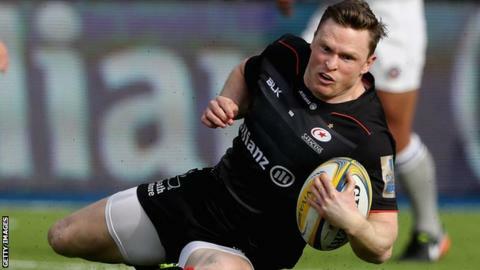 The 30-year old Saracens winger is a Champions Cup’s all-time scorer after 37 tries. Ashton believes he has been treated unfairly by the disciplinary process and also sees his fall from favour with England as the agitation behind his £420,000-a-year transfer to the Cote D’Azur that means he is no longer eligible for international selection. Eddie Jones selected him in his top Six Nations squad but he was rejected having been banned for making contact with the eye area of Ulster’s Luke Marshall, and this has driven him away ever since. “Abandoning my international career in other people’s hand is what I was tired of, the coach would always make every decision leaving players’ opinions out, so like every other player who does not like that, I disagreed and stepped out.” He stated. Continuing, Ashton stated that one day, he hopes to once again be in action playing rugby. However, for the time being, he remains contented with playing rugby abroad. He also noted that while at Saracens, they wanted him to stay on, as understanding people they are but they were well aware of the reason behind his leaving. He reiterated that he would not like to be playing in a place where he would always be banned. The 30-year old claimed a combination of his England exile and treatment by the board of rugby forced his action of swapping Saracens for Toulon. Ashton scored the only try of the afternoon against the French club he was moving to in June as Mark McCall’s holders booked a home Champions Cup quarter-final by a staggering 10-3 at Allianz Park on Saturday.